I don't know about where you live, but where we live here in Indiana it's hot. I know it's right smack dab in the middle of summer so what should I expect right? Thankfully there are ways to help keep cool even on the hottest days, especially when the AC has trouble keeping up. One of those is with my new Ozeri 360 Oscillation Tower Fan. 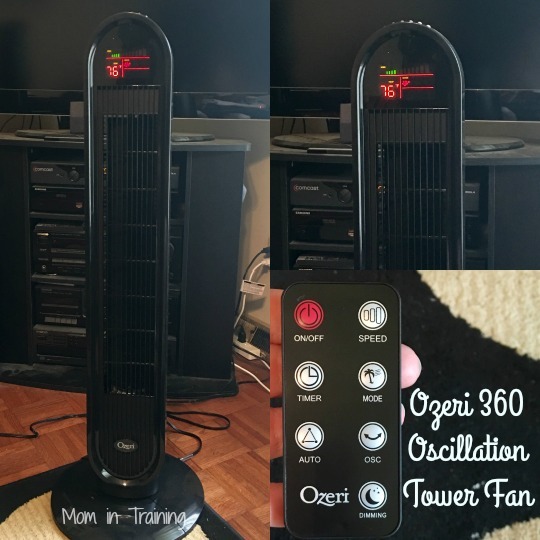 By using this fan I can help cool down the living room where we all seem to spend the most time when it's too hot to get outdoors. It looks great too because it's black like my room decor so it doesn't stick out like a sore thumb! • You can choose from 60, 90, 120, or 360 degree rotation for air circulation exactly where you need it. • LCD Display tells you exactly what selections you have chosen as well as the temperature of the room. • A programmable timer so you don't forget to shut it off. • A remote control so you can change the settings from across the room. It's not the quietest fan I've ever used, but it's not loud and annoying either when you are trying to watch television. I actually prefer a fan that I can hear the consistent sound of, especially when I'm trying to sleep. I find the fan sound to be soothing.